Go beyond iTunes and play most any media format including as MKV, AVI, MP4 & many others. Silky-smooth HW decode playback for 1080p content using the optional Crystal HD video card. Automatically add cover art and other metadata for your movies and TV shows from TheMovieDB and TheTVDB. 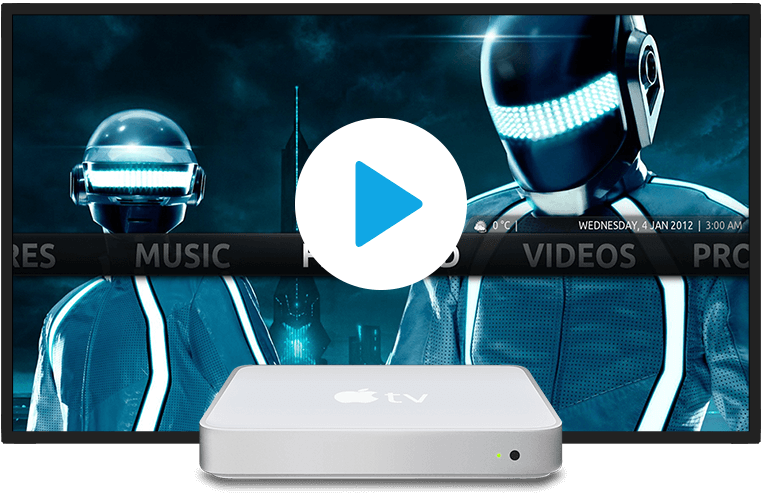 Use the Apple TV as a digitial hub for streaming media to other devices. Install popular 3rd party add-ons to get access to even more videos, c and other media. Keep tabs on your newly accessible media with custom playlists, and loop or shuffle them as you please. Stream photos from just about anywhere, and create beautiful slideshows right on the Apple TV. Get quick access to weather forecasts to find out if it's a good night for a movie. Keep track of all your favorite news and blog sites with quick access to RSS news feeds. Browse, play, and download videos from most any Mac, PC, or NAS drive...no syncing required. Bring your own, or add subtitles in seconds with free, one-click downloads from OpenSubtitles.org. Use trakt to keep tabs on what you’ve watched by syncing your play history and submitting ratings or reviews. Choose from over 20 different skins to get a feel that is 100% tailored to you. Use an iPhone, iPod Touch or iPad to take control with the intuitive Kodi Remote app. Updates are easily installed with just a few clicks through the native Kodi menus. Find new artists you'll love by accessing Last.fm, Pandora, Rdio and many other music streaming services. A powerful, lightweight OS optimized for Kodi 15.2. No waste, no bloat, just 100% pure speed. Get up and running quickly with our super-easy 5 minute installation.